Moving a step down to the S10e we see some compromises being made to keep the price in check, but it sure isn't 'lite' in the sense other makers like to use the moniker. Which is why Samsung went for the 'e', probably. 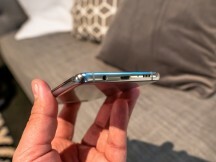 This slightly stripped down model is powered by the same chipset as the S10 and S10+ - no corner cutting took place here. Add to that the 128GB of storage and 6 gigs of RAM in the base model (8GB/256GB also available) and it's looking a lot like the the return of the super-mini - a true flagship for single-handed use. 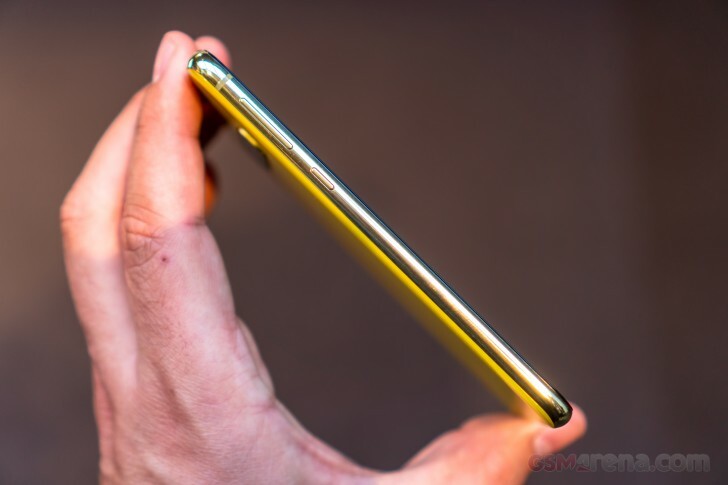 The Galaxy S10e is, indeed, tiny - it measures 142.2x69.9x7.9mm making it shorter than last year's Galaxy S9 by 5.5mm and 3.4mm shorter than the current Pixel 3. It's also pleasantly light (again, not to be confused with 'lite') at 150g - 13g less than the S9, though a marginal 2g heavier than the Pixel 3. If you've been comparing numbers, you may have noticed that the Galaxy 10e is slightly wider than the S9 even though it's got the same 5.8-diagonal display in what's a marginally taller aspect ratio 19:9 like the rest of this year's models vs. the 18.5:9 of 2018. 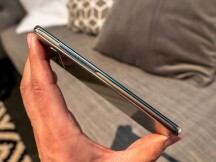 That's because the S10e's display is flat - no curved edges on this one. 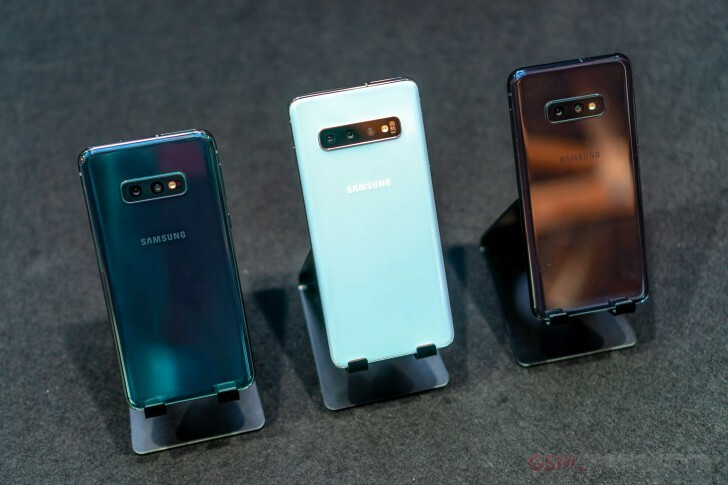 The savings had to come from somewhere, but there's also the matter that some people prefer their displays flat - and for the first time in three years Samsung has something for them in its flagship line. 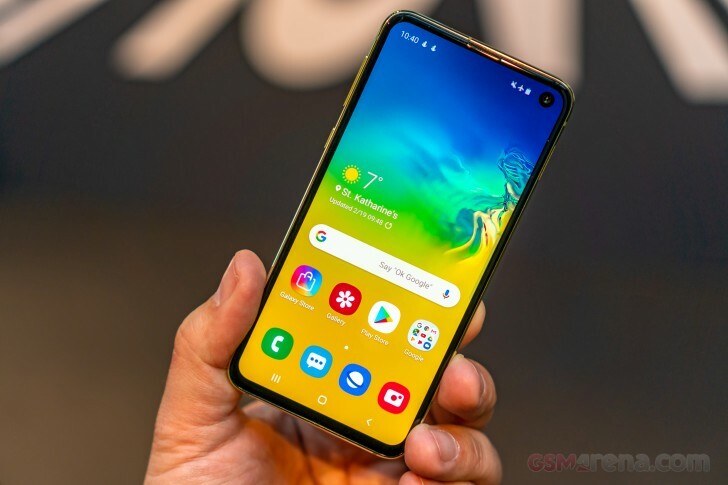 The bezel around the display isn't quite as slim as on the curved S10 and S10+, so there's a bit of a sacrifice to be made in terms of looks. This one is also 1080p in resolution - the rest are all 1440p. It does make for a more than adequate 435ppi pixel density on this diagonal, so we're not seeing this as a problem - if anything it'll be beneficial for gaming. 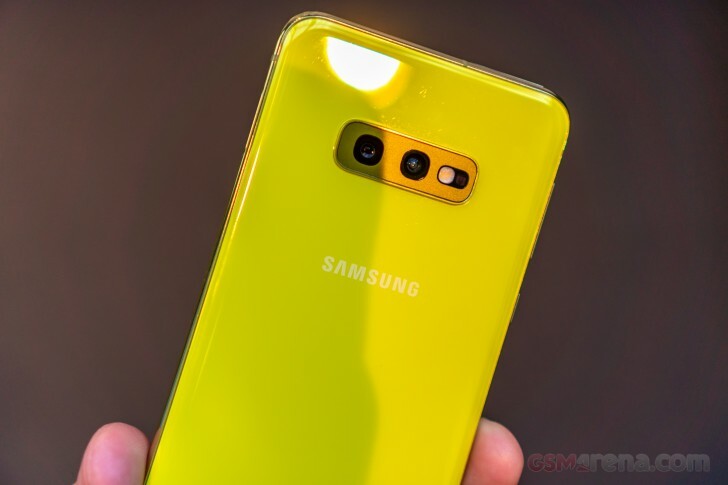 The 'e' can be had in the S10 Prism colors we mentioned before, but also gets an exclusive paint job of its on - Canary Yellow. It's a very bright and playful shade of yellow, and it will certainly fit those looking to stand out. Also exclusive to the Galaxy S10e is the side-mounted fingerprint sensor/power button on the right - it is an actual clicky button, not just a pad. It's likely though that the special treatment was dictated by the ultrasonic under-display unit not making the budget here and not motivated by usability . 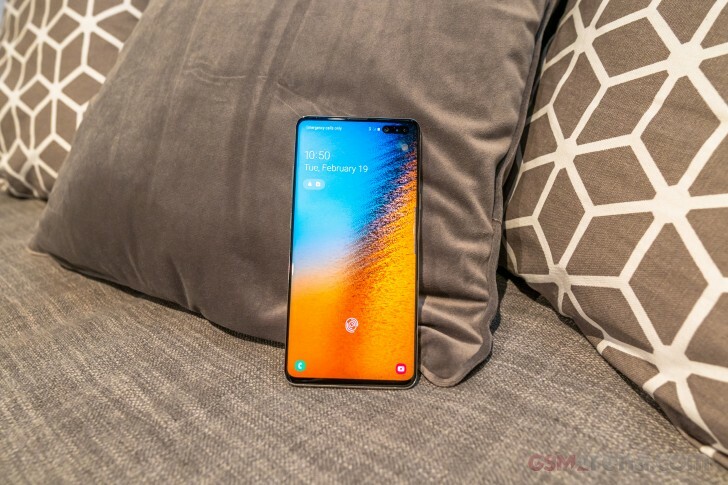 The sensor is pretty high up, just like the power buttons on the others, but with the Galaxy S10e being so small it's probably where it should be - the jury is still out on this one, but initial impression is that it's about right. 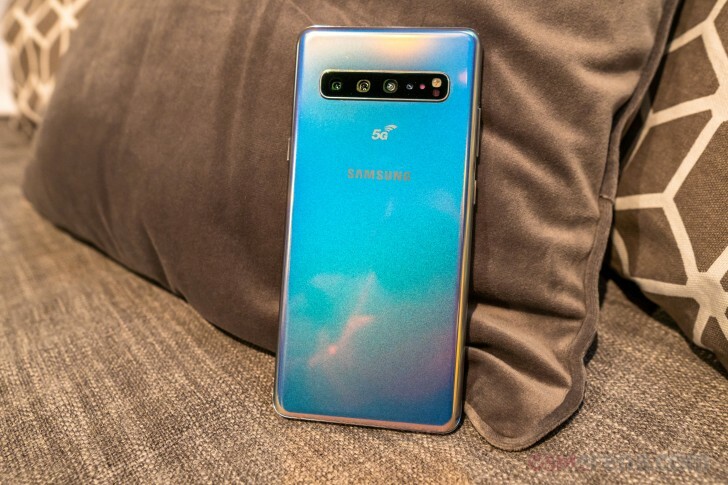 Other things that Samsung saved for the higher-priced Galaxy S10s are the telephoto camera and the heart rate monitor. You'll notice the S10e's camera assembly only has two modules, and those are the primary regular wide 12MP and the ultra wide 16MP one. 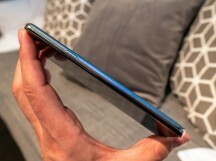 All things considered, however, the concessions made with the Galaxy S10e will likely make sense to a lot of people. 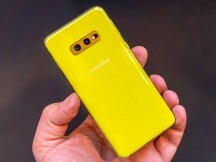 We now arrive at the Galaxy S10 5G's doorstep - we kept the ultimate S10 for last, because it'll launch later than the others plus it won't be as widely available. It was very much available in the experience zone, though, so it got the hands-on treatment just like the rest of the lineup. It's the largest of the bunch, with a 6.7-inch diagonal nicely keeping the 0.3-inch spacing between the different models. Measuring 162.6x77.1x7.9mm, it's actually 0.7mm shorter than the current Note9, but also wider by as much. 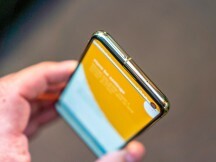 It's impressively thin for the slab that it is - the Note9 is 0.9mm thicker. As for weight, they've barely kept it below 200g, but the 198g seem reasonable for the display size and battery capacity - there's a 4,500mAh power pack inside this one. The differences go beyond the scale. 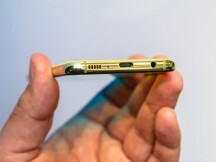 As if three cameras weren't enough, Samsung's fitted a fourth on the S10 5G's back. It's a time-of-flight module, with an HQVGA resolution (that would be a 160x240 point array for a total of 38,400 points), meant for enhanced depth readings with a Video Live focus capability in mind. And since a time-of-flight camera is made up of an emitter and a receiver, that makes for quite the crowded rear camera window. But wait, there's more. 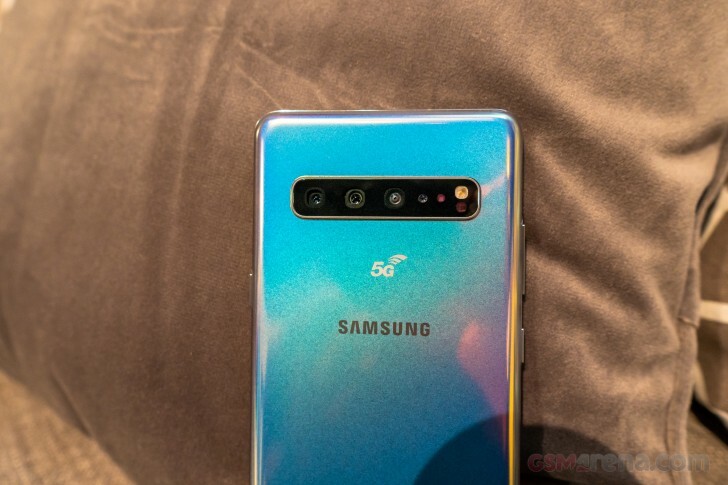 Another ToF camera is in the 'O' part of the Infinity-O display on the front, replacing the 8MP secondary snapper of the Galaxy S10+ and joining the conventional 10MP shooter. Good thing that it's a larger display, otherwise there'd be no room left for status and notification icons. 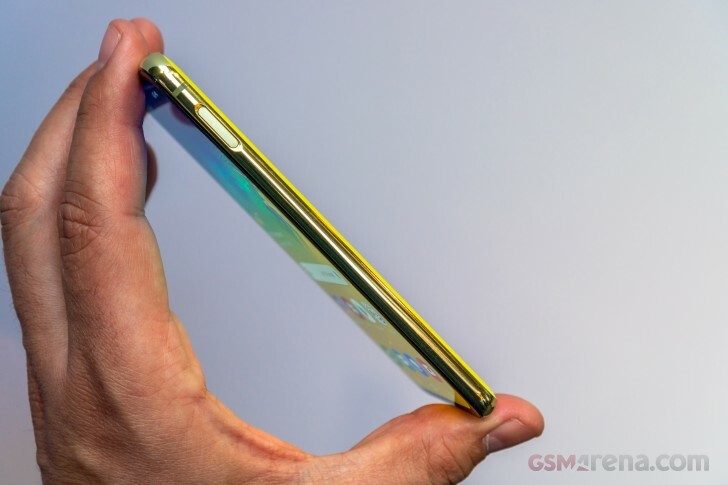 Of course, the true standout feature of the Galaxy S10 5G is right there in the name. Which is also presumably part of the reason for the delayed market launch and limited availability, as 5G networks are only marginally easier to find than unicorns at this point.